We have a large restaurant on the first floor of the the main building and two coffee shops located in the outpatients entrance. We have two coffee shops located in the outpatients entrance operated by our wonderful hospital volunteers. Our coffee shops offer a range of teas, freshly ground coffees, fruit juices, soft drinks, crisps and snacks as well as toast and toasted teacakes. 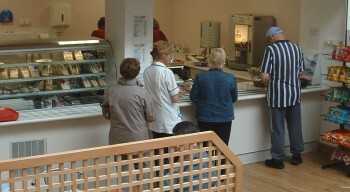 The coffee shops are located on the upper and lower floor of the outpatients entrance. All our volunteer services including the coffee shops operate subject to volunteer availability. If you would like to become part of this valuable service please find out more on our volunteers page. Visit our spacious, attractive, air conditioned restaurant on the first floor to enjoy a meal or relax with a Costa Coffee. We have external seating so you can sit and relax outside in fine weather. Colliers Restaurant is on the first floor and well sign-posted around the hospital. We serve a range of hot and cold food, 12 hours a day. You are welcome to pay by cash or debit card in our restaurant. Some dishes are subject to change due to business demands. Our restaurant catering services are provided by ISS Catering. The restaurant offers a range of hot meals, salads, sandwiches, soup, jacket potatoes with a range of fillings and a selection of chicken wraps, cakes and snacks. Vegetarian options are also available at each meal service. Colliers Restaurant is open every day from 7.30am until 8pm, though our breakfast and lunch menus are only available for limited periods during the day. A selection of food is available all day at our Café Qualita Costa outlet which is based in the restaurant. Café Qualita is our Costa Coffee outlet in the main restaurant area and offers a range of hot snacks, sandwiches, jacket potatoes, salads, homemade soup, cakes and snacks.